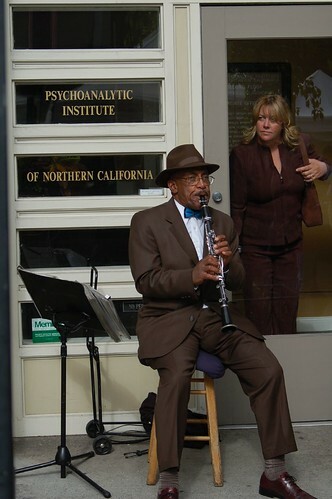 SAN FRANCISCO, California, May 1, 2007 – The San Francisco Public Library African American Center proudly announces the opening of Capturing The Moment, a jazz photography exhibit celebrating the rich Bay Area jazz scene by photographer James Knox. The exhibit will run from June 16 – August 16, 2007 in the African American Center on the 3rd floor of the San Francisco Public Library located at 100 Larkin Street in San Francisco. An opening reception for Capturing The Moment will be held on Sunday, June 17 from 2-4pm in the Latino Hispanic Room on the lower level of the San Francisco Public Library. The reception will include an artist discussion, a photo slideshow, and live music provided by the Terrence Brewer Duo. Refreshments will be served. Regular library hours are Sun 12-5pm, Mon 10am-6pm, Tues-Thurs 9am-8pm, and Fri 12-6pm. James Knox is music reviewer/photographer for www.j-notes.com. He has been photographing and reviewing the Bay Area jazz scene for the past five years. His work is featured on www.jazzreview.com, www.blogcritics.com, and www.sfgate.com . His photographs are featured on album covers for Clairdee and Adam Shulman, in addition to numerous artists’ websites. James credits his passion for photography and jazz to his father, Ritson Knox, and dedicates the exhibit to his family. For more information, please visit www.sfpl.org or www.j-notes.com. This entry was posted on Tuesday, May 1st, 2007 at 5:54 pm. It is filed under Special Feature. You can follow any responses to this entry through the RSS 2.0 feed. James, congratulations! This is extremely exciting. Make sure I get an invitation to the launch party! Please. Hot-Damm!! Congrats Papi. I wish I wasn’t already visiting Philly a couple weeks before the opening reception. I can’t make any promises, but if I can, I will see about FINALLY making a trip to the West Coast to see the exhibit and visit you. yay! i’m letting my mom know, we’re both proud! she’ll be free one weekday during the summer to check out the exhibit at the main library…and we’ll both be on pins and needles waiting to see what’s on show! I do believe I’ll have to make it over to the west coast. Congrats! It really is great to see you take sharing your art to the next level! Wish I could be there myself, but one of my best friends in the world lives much closer to the west coast. I’ll make sure that I share this info with him.